What is a Treinen Farm Corn Maze? The largest corn maze in Wisconsin — 15 acres! That’s nearly 15 football fields of corn! A unique outdoor challenge that builds teams. Aesop’s Fables were the inspiration for the 2015 Treinen Farm Corn Maze. 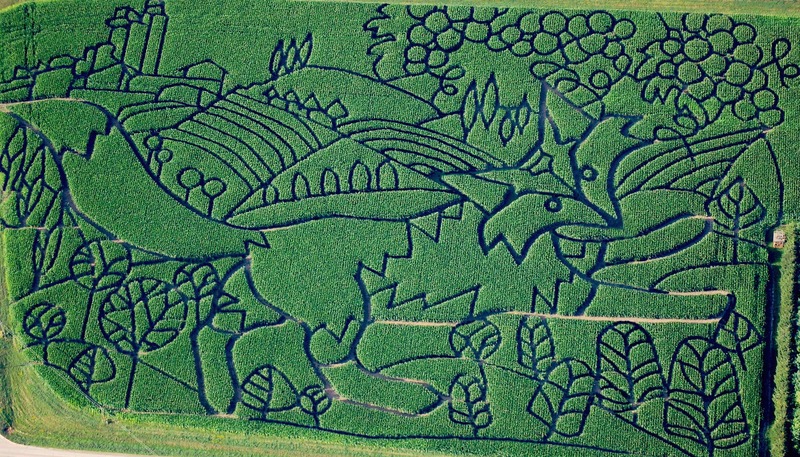 Our giant corn maze is the fable of The Fox and the Grapes. The children’s maze is the fable of The Tortoise and the Hare. This year’s maze is based on the Aesop’s Fable, The Fox and the Grapes. But our adorable little fox doesn’t seem too sad that he can’t reach the grapes, maybe because he is prancing through beautiful Tuscan vineyards and olive groves near the medieval hilltop town of San Gimignano. Aesop’s Fables are credited to Aesop, a slave and storyteller believed to have lived in ancient Greece between 620 and 560 BCE. You’ll recognize some of the most famous: The Fox and the Grapes; The Tortoise and the Hare; The Ant and the Grasshopper; The Boy Who Cried Wolf; The Goose That Laid the Golden Egg; The Town Mouse and the Country Mouse. His stories always concluded with a moral. Moral: There are many who pretend to despise and belittle that which is beyond their reach. Not everyone’s ready for the big maze challenge, but take some time to explore our much smaller Children’s maze. You’ll get just a little lost, and you can play the Finger Fun Game while you’re in there.